The blood had dried on his face and on the pelt he wore. His skin was tanned by the sun, and hairs were beginning to sprout on his young man’s skin. He was not good at handling the sail and had quickly abandoned the idea of hoisting it, simply letting the waves carry his sailboat. He spent the days and nights standing in the bow, behind Puppet dressed in the grey pelt, with the wind blowing over his body and sprinkling droplets of salt water on his skin. He had placed his prosthetic arm in the bottom of the sailboat. Fine cracks had begun to appear on the wood. It had been the arm of a puppet swept away by the ocean, and also the limb of a strange child, the paw of a dog turned murderous, and the handle of a weapon; most of all it was a present from his brother, a present he didn’t know what to do with. The first days, the older brother passed a few small islands, then, nothing. Fewer and fewer birds travelled with him. He rarely thought of the past. In the bow, looking out at the ocean’s black water, he sometimes thought he was seeing things: giant squids, tritons and sirens swimming in the depths. His kin, he told himself. Monsters like him. In his rare moments of sleep, he saw himself as a bloodthirsty god, marching over plains of burnt grass covered with cadavers, Puppet in his hand like a mace. He slaughtered women and children, and Puppet laughed, laughed and laughed. After sailing for several days, despite his frugality, his stores of food were coming to an end, and he fasted in earnest. Always under the sun in the bow of the boat, he sometimes caught himself sleeping standing up. His body thinned out, the body of a wandering saint, with dried blood encrusted in the hollows of his face, and the cruelty of the world in his belly. He kept squinting: the light of the sun seemed threatening. One morning, opening his eyes, the older brother saw a raven standing on Puppet’s head, and he thought he must have passed an island while he was sleeping, that the raven must have come from land nearby. He began to dream of Puppet’s home country, a world of wooden beings, a land of war, of bloodless wars, all splinters and wood shards, and the thought pleased him. It might have been one of his mother’s ideas, he thought to himself, not expecting to be thinking about her, and he wondered whether she still talked to them, to him and his brother, every night at supper, if she still warned them against the temptations of the ocean, against that dog of a father that the brothers had wanted to meet despite the fear of sinking into the depths, never to return, into the depths from which the older brother sometimes thought he heard his brother’s laugh rising, as if he were at some eternal carnival with the tritons and the sirens. The older brother hadn’t spoken in a long time, barking, mostly, over the last few months. The sound of his voice startled him. It sounded scratchy. He wanted to hear it again. “Caw? Caw, what?” he asked the raven, who turned its head toward him quizzically, but did not answer. The next day, clouds filled the sky, growing darker as time passed. The older brother’s ribs were sharp under his skin, just above his hollow abdomen. He felt emaciated, his pelt huge and shapeless around him. He was a gaunt animal, a starving old dog lost on an ocean he didn’t know the end of, but where he floated without fear, without fearing death, but without wanting it either, without worrying about it. He was tired. He had a hard time telling sleep from waking. And his brother’s laughter trickled up from beneath the waves more and more often, a jellyfish laugh, the laughter of the deep. The older brother’s ears were full, and his nose and his mouth. The laughter came into his body and filled his belly and his head, denying his brother’s death, as if it had been only a mirage. Often, the older brother opened his heavy, pasty mouth to ask the raven, who never left him, “Do you hear it too? Do you hear?” The raven didn’t answer, not even deigning a simple caw. It hopped along the gunwale, sometimes opening its wings to keep its balance. The older brother sometimes closed his eyes and saw a wide, black, furry head emerging from the ocean, long strands of seaweed tangled in its fur, drooling over the boat as the older brother had so often seen him drool in his dreams. He had always been that big in his dreams, but the jaw was weaker now, with decayed teeth hanging loosely from rotten gums, and he told himself that he scared him less than before. When, after many days of grey, rain finally fell on the older brother’s face, the water washed the dried blood, which ran into his mouth, and he drank it. The rain also washed his pelt, caked with the blood of the pig-children and their mother, and water mixed with blood pooled in the bottom of the boat. The raven cawed while the rain ran over its feathers. The older brother gathered water in the palm of his hand and wet his face. He threw his head back and drank the rain as it fell from the sky, while the raven ran around in the bottom of the boat, circling around him, cawing. His brother’s laughter echoed under the sail in the shelter, and the older brother began to sing a song without words, though words slipped into the tune, words he didn’t know, archaic words maybe, or new words created from nothing, devoid of meaning, a tune like his mother used to sing, maybe the same one she had sung on the first day of his life to reassure him while she cut his arm off. He sang to chase away his brother’s laughter, but couldn’t. His song rose from his empty stomach, where the laughter had already seeped in, and it filled the sail, mixing with the laughter that quickly drowned out the music. The older brother stopped singing and began to cry, tears streaming from his dry body. The next day, when morning came, the rain had stopped and the older brother had fallen asleep, covered with the grey pelt, Puppet next to him. In his dream, he was walking on the ocean as one might walk across a desert, an ocean covered in bodies, a dry sea, not fit for life, and he felt his hunger scream from the pit of his hollow stomach, a screeching voice like his brother’s on his angry days, a raging voice that nothing but the taste of blood would appease. And always he heard his brother’s laughter, laughter that sneered at death, and the older brother wanted to believe it, dreaming of his brother alive for all time. At the peak of the afternoon, as the sun began to pierce the clouds, the raven joined him under the sail. The older brother turned to the bird in his sleep and asked, talking in his dream: “Did you hear him laughing?” The raven snapped its beak and answered in its bird’s voice, the voice of a ventriloquist in which the older brother thought he heard his own: “Caw. Your brother hasn’t laughed in a long time. Your brother is dead, unquestionably dead.” Then the older brother woke, staring into the empty eyes of the silent bird. How he hated this bird of ill omen. He grabbed it suddenly with his hand, brought it quickly to his mouth, bit into its throat and felt blood run over his tongue, and twisted its body to break the neck. Then he came out from beneath the sail, knelt under the sun, plucked his victim with his teeth, and ate the body raw before throwing the remains overboard. He got up and looked out over the horizon and saw a dark shape swimming under the surface, a ghastly shape swimming away from him. He knew it: it was his father. He had set sail for his father. He had always been heading here. His brother had died wanting to find their father; if his brother was dead now, it was because his father had killed him. And now, the older brother was going to kill his dog of a father. Brothers is now available from QC Fiction, a new imprint of Quebec fiction in translation. Click here for more information about the book. 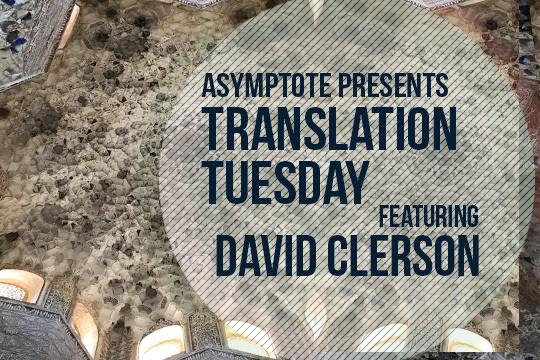 David Clerson was born in Sherbrooke, Quebec, in 1978 and lives in Montreal. He was a finalist in Radio-Canada’s 2012 short story competition. Brothers is his first novel. It won Quebec’s Grand prix littéraire Archambault 2014. Katia Grubisic has been working as a writer, translator, and editor for fifteen years, and has published poetry, fiction, translations, and criticism in Canada and internationally. She has been on the editorial boards of a number of literary magazines and her work has been shortlisted for the CBC Literary Awards and the AM Klein award. Her 2008 poetry collection, What if red ran out, won the Gerald Lampert prize.